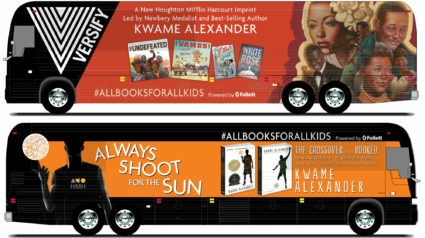 Houghton Mifflin Harcourt (HMH) Books & Media today announced a multi-city, multi-author tour to celebrate the launch of its highly anticipated Versify imprint, founded by acclaimed author Kwame Alexander. Beginning April 1, Alexander and Versify’s inaugural group of authors and artists are hitting the road for a weeklong bus tour that will make stops at schools, bookstores and public venues across the Northeast. Versify’s mission is present books to “electrify, edify, and exemplify” with accessible and powerful prose and poetry that celebrates the lives and reflects the possibilities of all children. Its debut list includes four books: The Last Last-Day-of-Summer by Lamar Giles; ¡Vamos! Let’s Go to the Market by author/illustrator Raúl the Third; White Rose by Kip Wilson; and Alexander’s own picture book, The Undefeated, which is illustrated by Kadir Nelson, who will join the tour for select events. The books, which go on sale April 2, have earned a combined 13 starred reviews from industry media to date. In addition to a number of classroom visits, the Versify team will make public appearances with the Center for Fiction in Brooklyn, N.Y. (April 1); Harvard Book Store in Cambridge, Mass. (April 2); An Unlikely Story in Plainville, Mass. (April 3); Words Bookstore in Maplewood, N.J. (April 4); Children’s Book World in Haverford, Pa. (April 5); and The National Gallery of Art and Politics & Prose in Washington, D.C. (April 6). For nearly two centuries, Houghton Mifflin Harcourt has published some of the world’s most renowned novels, nonfiction, children’s books, and reference works. As part of a leading global learning company, it is uniquely positioned to offer educational and entertaining content for all audiences. Its distinguished author list includes ten Nobel Prize winners, forty-eight Pulitzer Prize winners, fifteen National Book Award winners, and more than one hundred Caldecott, Newbery, Printz, and Sibert Medal and Honor recipients. Current and recent authors include Tim O’Brien, Natasha Trethewey, Tim Ferriss, Amos Oz, Ursula K. Le Guin, and a celebrated roster of children’s authors and illustrators including Kwame Alexander, Lois Lowry, and Chris Van Allsburg. HMH is also home to The Best American series® The Whole30®, Weber Grill, How to Cook Everything®, and other leading lifestyle properties; books by J.R.R. Tolkien; and many iconic children’s books and characters, including Curious George®, The Little Prince, and The Polar Express. HMH Audio, a newly launched imprint, will publish audio books of HMH front list and backlist titles starting in fall 2019.